Apple just unveiled the next generation of their popular MacBook Pro lineup at the “Hello Again” special event at their corporate headquarters. While the main new feature has been revealed earlier in the week, Apple still had plenty of other surprises in store, and explained in further detail how exactly this new Touchbar would work. Phil Schiller has announced that the new MacBook Pro is the thinnest and lightest computer they have ever made, thanks to the brand new aluminum body, which is metal on all sides. The computer will come in both 13 and 15-inch sizes. The 13-inch version is 23 percent thinner in volume and is 17 percent thinner than previous iterations, and it only weighs three pounds. 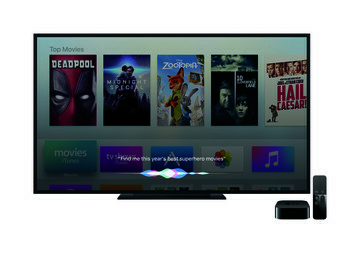 The 15-inch is 14 percent thinner and 20 percent smaller than previous versions and weighs in at four pounds. The trackpad on the new MacBook Pros is also twice as big and sticks with the Force Touch branding and uses the new 2nd-gen butterfly mechanism that is revised from the original 12” MacBook. The new MacBook Pro has been confirmed to have a new OLED touchstrip on top of the keyboard, replacing the former function keys. If you had seen the previous leak, it looks exactly like that. Except now it is dubbed the Touch Bar, rather than Magic Toolbar. The Touch Bar is a keyboard panel featuring Retina display with multitouch, and it responds to gestures and taps. The new Touch Bar also adapts to whatever software you are using, which is fantastic. It also shows you UI elements for the software that you are using, such as the photo straightening tool in iPhoto. Or if you are in Mail, you can do things like flag messages or trash them. The adaptive nature of the Touch Bar means that it can make using any software programs on your MacBook Pro easier than ever before, and it feels much more intuitive than using just the trackpad, or a traditional mouse and keyboard. Touch ID is also being implemented in the Touch Bar, bringing Touch ID to the Mac for the very first time. It will be where the power button normally is, so it’s integrated with turning the computer on and off. If you need the old function keys, you can still get them by pressing the “fn” button, and the traditional keys make their appearance in the Touch Bar. And one of the more fun things you can do is easily select emoji directly from the Touch Bar itself, rather than bringing up the menu with keyboard shortcuts that you may not know (CTRL + Command + Space by the way). Users can customize the Touch Bar for each application that they use, so it won’t be hard to remember your shortcuts if you programmed them in. Additionally, it appears that Apple already has a lineup of third-party developers (such as Adobe Photoshop and Algoriddim’s dJay software) that will implement the Touch Bar into their software applications, so you won’t have to wait around for support. Now that Touch ID is implemented into the Touch Bar, users can fast-user switch directly with Touch ID, rather than going through menus to switch users. And with more sites enabling Apple Pay through the web, it’s super easy to pay for things online with the security of Apple Pay. The new 15-inch MacBook Pro includes a much better display that looks great. It is now 67 percent brighter than the 12-inch MacBook display. It also now features a Core i7 processor, 2133MHz memory, Radeon Pro graphics, Polaris architecture, and an SSD up to 2TB. The speakers are also louder with twice the dynamic range. The 13-inch MacBook Pro has Core i5 and i7 processors with an Intel Iris GPU. Both models also feature four Thunderbolt ports, which can be used for charging, displays, and other peripherals. It also has a USB-C port for power. It’s no surprise — the new MacBook Pro is a great choice for power users. The battery life will clock in at about 10 hours, according to Apple, though real-world usage will cause the time to vary. If you are not in the market for a pro-level machine and prefer the Air style, then Apple is now offering another 13-inch MacBook Pro model that does not have the Touch Bar and Touch ID, but the specs. 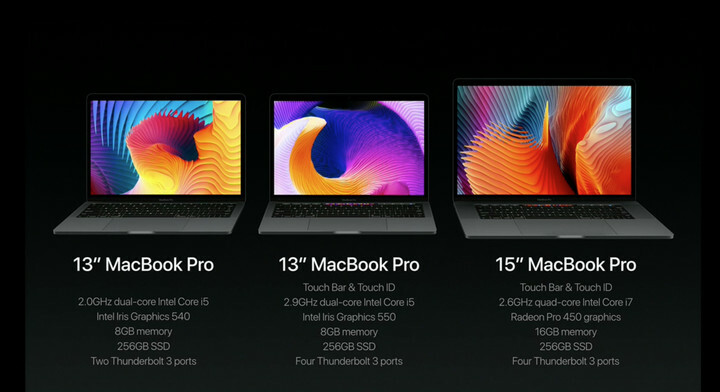 The regular 13-inch MacBook Pro starts at $1499, the 13-inch MacBook Pro with Touch Bar and Touch ID starts at $1799, and the 15-inch model starts at $2399. All three of these computers can be ordered online today. The regular 13-inch model will begin shipping today, with a 2–3 week timeframe for the Touch Bar models.